Please refer to our stock # 11225 when inquiring. This gorgeous vintage necklace by Trifari has such an interesting look when worn. It measures 15" long x 3/4" wide and has an additional 1 1/4" long segment with attached 2" long choke chain giving this a maximum wearable length of 18 1/2". 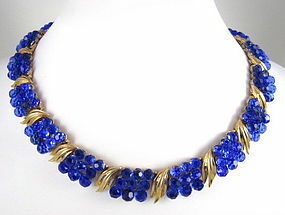 It is a rich matte gold tone finish and the front is elaborately set with dozens of faceted crystal "briolette" balls in a saturated hue of blue. It is in excellent condition and is signed "Trifari" at the fold over clasp.